Why is this model so special? 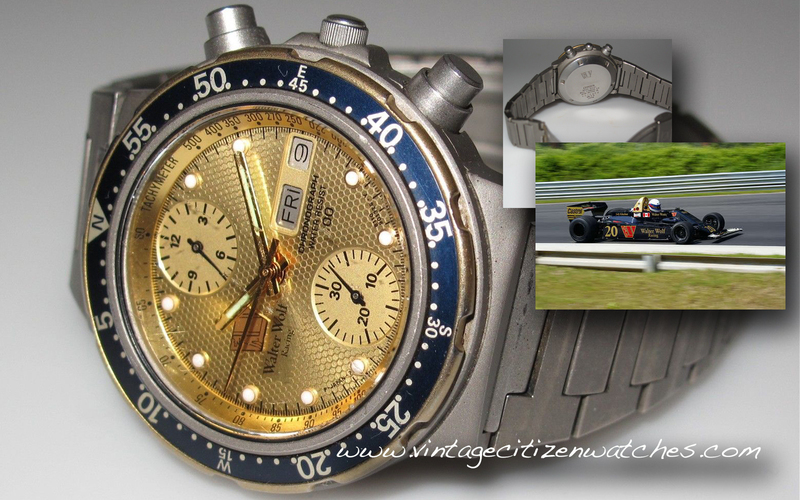 Because in the 70’s Citizen produced a lot of interesting watches and their chronograph calibre 8110A was one of the best: fly back, column wheel, day-date, hi beat automatic. What an awesome movement! And where is a chronograph at home?! In a race! So… Citizen made this Walter Wolf watch, with a special case (the one in titanium was one of the early watches to use this material for cases and bracelets). The other one is black coated metal. It also had a bidirectional rotating bezel, a nice feature usually not used in chronographs. On the outer circle of the dial it is the mandatory race related Tachymeter so the outer rotating bezel is a nice addition. 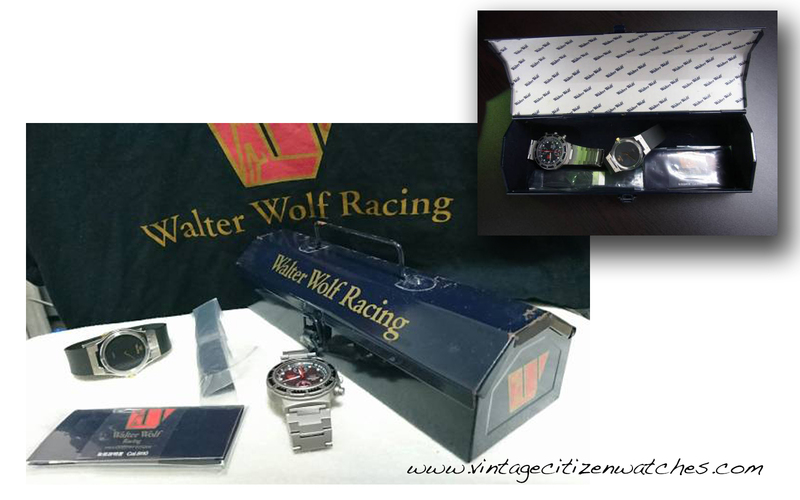 Read more about Walter Wolf Racing HERE. Back to the watch! 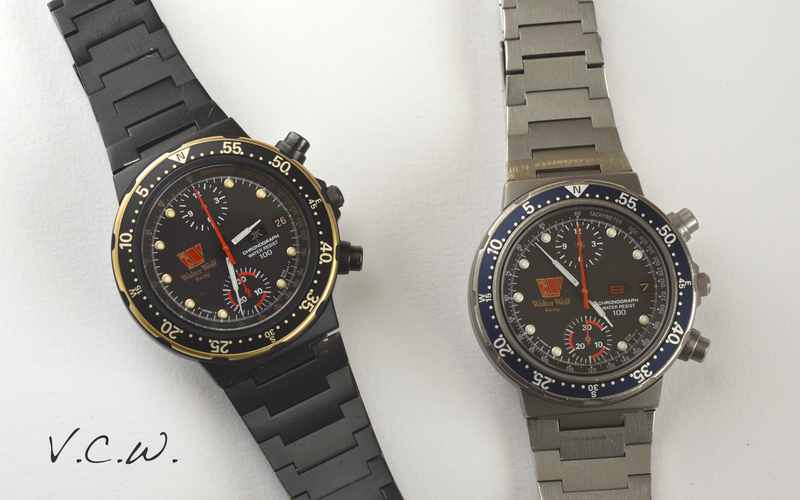 The black one is made in 1982 and the titanium in 1983. As I was saying the case is special to this model and by doing this, Citizen managed to obtain a 100m WR. That is impressive. The crowns and pushers are non screw in but the caseback is. The winding crown is hard to operate because it is very small. On the caseback we have the Walter Wolf logo (present on the dial too), the brand, the material, the model and the serial no. The country of manufacturing is obviously Japan. In fact I think this model was made for Japan (all the models I know about had English – Japanese day wheel). The bracelet is well integrated with the case and is the perfect design for this racing dedicated watch. The dial is beautiful, black (there is one more model with a golden dial), with a lot of interesting details (please magnify the pictures for better understanding). The luminous material is made with Promethium 147, a radioactive material. Read about it HERE. It is marked P-JAPAN-P. The rotating bezel is another interesting feature. This in not the usual diving style one but a countdown type! Note the 60-0 markings. (not the usual diving 0-60) On top of this there is a cardinal inscription (N E S W) for better navigation, of course! 🙂 The movement is the usual Citizen cal 8110A, a vertical clutch chronograph (beating at 28.800 bph) with column wheel and fly back function. It has a day-date indicator. The rotor is special with a different inscription than the common 8110A found in the other models. Here it is another variant, the golden dial one, same titanium case and bracelet. Notice the honeycomb dial pattern. In the picture below you can also see the Walter Wolf F1 car. Conclusion: A special watch, loaded with features, a joy to wear and use, a pleasure for the eyes and a huge happiness for the heart and soul of the blessed owner. Read more about Citizen chronographs HERE. 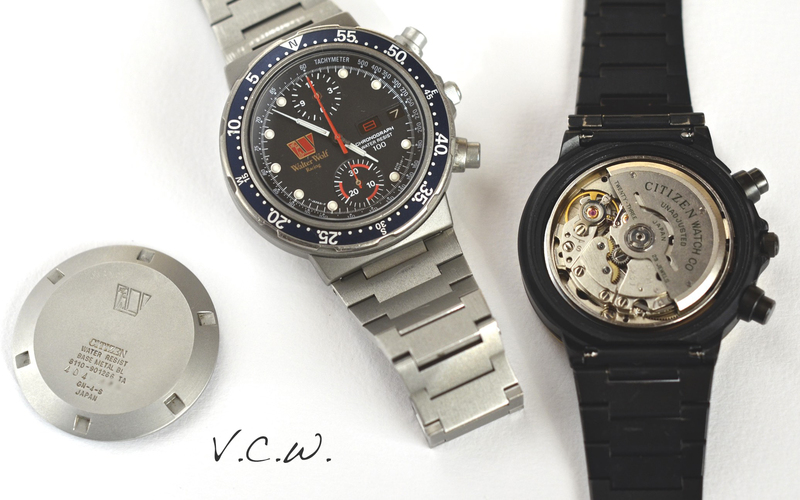 This entry was posted in Citizen automatic chronograph, Citizen chronograph, Citizen date, day-date, hand winding, hand winding chronograph, hi beat, Uncategorized, vintage Citizen and tagged black chronograph, black Citizen chronograph, Chronograph, chronographs, citizen, Citizen 8110A, Citizen Walter Wolf, fly back chronograph, titanium chronograph, titanium citizen chronograph, titanium watch, Walter Wolf, Walter Wolf Chronograph, Walter Wolf Racing. Bookmark the permalink.